The Fort McMurray ski patrol is a group of trained patrollers who volunteer their services at Vista Ridge ski hill in Fort McMurray. We provide volunteer first aid services on Thursday and Friday evenings (approx. 6pm to 8pm), and Saturday and Sunday (9:30am to 4pm). The Fort McMurray ski patrol group began in 1982. 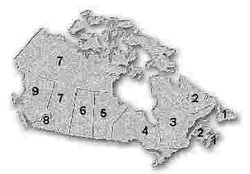 The Fort McMurray Zone is one of 11 zones within Mountian Division, of which there are 9 Divisions across Canada, all part of the National organization called the Canadian Ski Patrol System (CSPS). The Canadian Ski Patrol (CSP) is a registered non-profit corporation comprising highly trained volunteer and professional members. The System is national in scope and was formed to promote safe skiing and to provide assistance to injured skiers. The CSP's membership of more than 6000 patrollers provides a Canada-wide, highly-skilled and responsible service to the skiing industry. The CSP was formed in 1941.